Oh No! is a favorite book at our house; my three-year-old loves to recite it, especially the kudzu vine and banyan tree parts. The other day as we were driving down the road she said, "Wow! Look at that cloud--it's a 'whopping big branch.'" Yep, guess she picked up that vocabulary. I brought a butternut squash to class, and after we read Sophie's Squash, we took a vote--eat it, or name it and put a face on it? . . . Meet Bentley. After we read Hello, My Name Is Ruby, I turned to the illustration of the little birds flying in an elephant-shaped formation. In each of the classes students recalled the little fish making a big fish in Swimmy. We talked about similarities and differences in the two illustrations. We read about sharks and trains. The kids loved the poem by John Ciardi (and I love my Folkmanis shark puppet). The second-graders even requested an encore. But here is the interesting thing: When I first memorized this poem, I took it from National Geographic Book of Animal Poetry: 200 Poems with Photographs That Squeak, Soar, and Roar! edited by J. Patrick Lewis, but later my daughter was reading You Read to Me, I'll Read to You, and the version there is different. What a difference a word makes. Every once in a while, it is nice to turn your brain off, sit back with a comfortable pillow and enjoy a summer action movie. Are they formulaic? Yes. Are they even a bit mind-numbing? Yes. But, in the end, you usually walk out with the satisfaction that you enjoyed a break from reality for 2 hours. Books can give you that same escape - and in some cases they are actually well-written enough to stimulate some of those brain cells in the process. Steelheart, by Brandon Sanderson, reads just like you are sitting in the theater with some popcorn enjoying the latest action flick (without the mind-numbing effects) - it is fast-paced, interesting, often-times funny, and has unexpected twists to keep you entertained. To seal the icing on the cake, it also has well-developed characters - most of which are actually quite likable - and there is a just a touch of romantic tension to break up the action. One day, Calamity came (a burst that appeared in the sky and started giving ordinary people incredible powers) - and now, what used to be Chicago, is ruled by one of these transformed humans, called Epics. Some Epics have minor powers, like "Curveball" who could fire a handgun without ever running out of bullets. Other Epics, however, are much more powerful and use that power to control and manipulate those without powers. 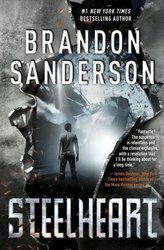 The most dangerous and powerful of these Epics, is Steelheart. He has superhuman strength and is impervious to bullets or swords - and as an added bonus, he is able to control the elements. All Epics have a weakness, if you can find it - but, can anybody defeat Steelheart? David watched Steelheart kill his father ten years ago, and has been on a mission to defeat Epics ever since. He does have one advantage - he saw the invincible Steelheart bleed. He has used every resource he can to compile a list of Epics around the city and to uncover their weaknesses. Now, he only has one problem, he can't do it alone. So, he searches out the one group of people who are willing to take on these superheroes - the Reckoners. Brandon Sanderson excels in bringing his characters to life and this book is no exception. The Reckoners are a diverse group. Some of the characters include: Abraham, the muscled weapons man; Tia, the red-haired scholar; Cody, the southern boy who provides fire-support (but, who also pretends he is from Scotland and always has a tall-tale story to tell - and consequently establishes comic-relief throughout); Megan, who is the point-person in the team and also David's romantic interest; and the Professor, the serious leader and founder of the group. In a world of humans vs. superhumans, there seems to be no end to the conflict. But, if they can defeat Steelheart, they may have a chance to get their lives back. As the first in a series, the ending of this book furnishes an appropriate twist that will make you ready for book two. I would definitely recommend this book to any lover of fantasy/action/adventure/fun. Review copy received from the publisher. I spent Thursday and Friday attending Utah Valley University's Forum on Engaged Reading in Park City. Two days of talking about books and ideas to get kids reading is my idea of a holiday, and this conference was exactly that. Keynote speakers included Sarah Pennypacker, Marla Frazee, and Jim Murphy. One of the things that has been bouncing around in my head since the conference is the idea that what is NOT in a book is just as important as what IS in a book. I took years of piano lessons, and one of the hard lessons I had to learn was the importance of rests in music. As a kid, I wanted to rush through the rests (and the half notes and whole notes, for that matter) and get to the important part of the music--the part I actually played. I learned, of course, that by not playing--by creating space--I was making music. So, I've been thinking about the words a writer doesn't write, and the illustrations the artist doesn't draw in relation to rests in music. Rests are an essential part of music; they give the audience a little break, provide time to reflect, and build anticipation. Silence sets a phrase apart, punctuating it and adding emphasis, and it frames the entire composition. Music requires silence. The parts that aren't included in books do much the same thing. At the conference, Marla Frazee talked about an illustration in her book, Boot & Shoe where the picture of the dogs is small in relation to the page. The white space--the nothingness--that surrounds them creates a feeling of vulnerability. She also talked about the effectiveness of leaving some moments in the story off the page. As an example she pointed to one of Lisbeth Zwerger's illustrations for The Gift of the Magi where Jim stops inside the door and Della, who has cut her hair and sold it, goes to him. The characters are obscured behind the half-closed door, we can't see their faces, only their embrace. Zwerger leaves the poignancy of the moment in our imaginations, she allows us to create that moment and to see it for ourselves. Brilliant. Sara Pennypacker said, "A book is not a monologue, it is a conversation," and to demonstrate her point she read the first page of Clementine. (If you don't know how that book starts, go read it--as soon as possible--because it is one of the best opening pages in children's literature.) The entire page exemplifies that author-reader conversation, but let's look at just one sentence: Clementine tells the reader, "Someone should tell you not to answer the phone in the principal's office, if that's a rule." Without being explicitly told, we know that Clementine answered the phone in the principal's office, and we understand that she got into some sort of trouble for answering it. We engage in the story because we are now part of the story. Pennypacker explained that she leaves things out so the reader has to connect point A and point B and not just get the joke, but make the joke themselves. And that's how you engage a reader. Because sometimes what is not said makes the biggest statement. Also, learning that Jim Murphy hates to write brings me great comfort, but that's a subject for another day. Remember practicing tongue twisters as a kid--giggling as words with percussive consonants, gliding vowels, and rhythmic syllables twisted around in your mouth, and concentrating on making the sounds come out right? 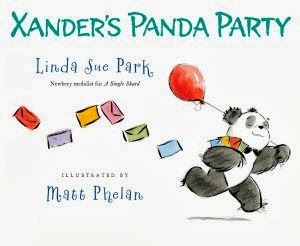 Xander's Panda Party by Linda Sue Park is that kind of fun. Xander is planning a panda party, but he is the only panda at the zoo, so he changes his plans and invites all the bears. But, when Koala points out that although she has been invited, she is not actually a bear, but a marsupial, Xander decides to invite all the mammals. Soon other animals ask to be included and Xander worries that his party plans might fall through. Fortunately, Amanda Salamander offers to help, and together, Xander and Amanda plan a party for all the animals at the zoo. A truck that arrives just as the party is about to begin brings Xander a surprise that makes the party perfect. "Xander planned a panda party." "Xander's party preparations took great pains and perspiration." "He wasn't sure what he should do. He chewed a slew of new bamboo; he nibbled, gnawed, and thought things through." My one quibble is that, according to the text, the name Zhu Zi is pronounced "like saying 'zoo' mixed up with 'shoe.'" But Zhu Zi--Chinese for bamboo--is pronounced "jū dz" which doesn't sound, to my ear, like "zoo mixed up with shoe." This celebration of sight and sound is like . . . a party. I am serving working as a Cybils panelist this year, so I've managed to convince my family that, at least for the next two months, my reading will officially be classified as work--not recreation, but really fun important work. Aaaah . . . I think I'll go work. My three-year-old has recently discovered book trailers. She likes to sit on my lap while I'm at the computer, and when a book jacket or spread appears on the screen, she points to it and says, "Let's watch that one." As soon as the music starts, I usually end up with a couple other curious kids watching over my shoulder. Book trailers are magic. Oh No, George! by Chris Haughton is currently one of my daughter's favorite books, and she loves the trailer as well. Here are a few book trailers from this year that we enjoy. It's that time of year when two of my favorite book blogs start up again. Which of this year's new crop of books do you think are most distinguished? Read along or join in the discussion of Newbery-worthy books at Heavy Medal. And look at some of the best picture books of the year at Calling Caldecott. Also, I've recently updated our Reading About Reading page, so if you're looking for something new, check it out. It is almost time to put summer behind us as the night air turns a little crisper and the smell of fall starts creeping in. At least that's what the calendar says, but days of scorching temperatures still feel like they will be here forever. So, if you are looking forward to the blazing heat disappearing a little faster, maybe it is time to crank up your air conditioner and start perusing some autumn books. Although the cover of Sophie's Squash screams all things fall with red and orange leaves cascading to the ground from a bare tree, the story actually translates well through the seasons. As far as classification goes, you could also place this with unusual pets and spunky kids. 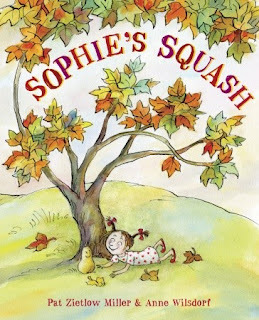 The story begins with Sophie and her parents taking a trip to the farmer's market to pick up a squash for dinner. This particular squash never makes it to the dinner table, however, because it is adopted and named Bernice (with a drawn-on face for emphasis) by Sophie. Bernice becomes part of the family. She attends story time at the library, visits her other squash friends at the farmer's market and plays outside with Sophie. Over time, Bernice starts to get a little soft (as squash - and other perishable items - tend to do). Sophie's parents valiantly try to replace Bernice with a more appropriate toy, but Sophie insists that Bernice is "just the right size to love" and clings to her protectively. Her parents grudgingly concede - after all, they "did hope she'd love vegetables." Sophie is energetic and full of imagination and her character is what makes this book special. When Bernice starts to get splotchy, Sophie insists her friend just has "freckles" and when her mom suggests cooking the vegetable with some marshmallows for supper - she just covers her little squash "ears" and warns "Don't listen, Bernice!" As Bernice gets older and more blotchy, Sophie seeks advice from a local farmer about how to keep her squash healthy. She takes his advice of "fresh air . . . good, clean dirt . . . a little love" and plants her squash in the backyard. She waits through the winter and is pleasantly surprised by spring's revelation. This story teaches about love, regeneration, planting and friendship. The watercolor pictures fit very well with the soft, sweet, spunky story and the colorful images will keep your eyes drawn to the page. 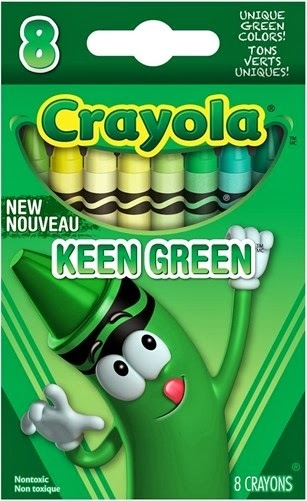 This is a must-have for your fall book collection. If you want to read more about how this story came to be published, or rather how it was almost not published, check out this link. 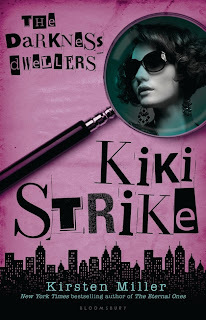 For a very fun, light read, I decided to read the Kiki Strike Series. The reason I really like these books is because they do not have language, but they are still geared to a slightly older audience than my normal middle grade reads. 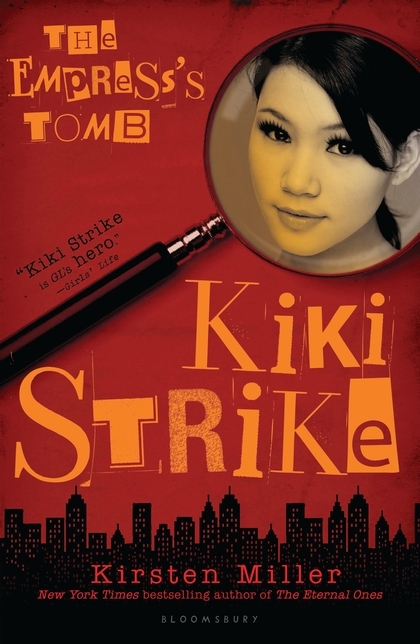 Kiki Strike is girl who is a little bit different. She is often described as "elfish" with her pale skin, and her shimmering white hair, but, she is also very pretty, in a different sort of way. 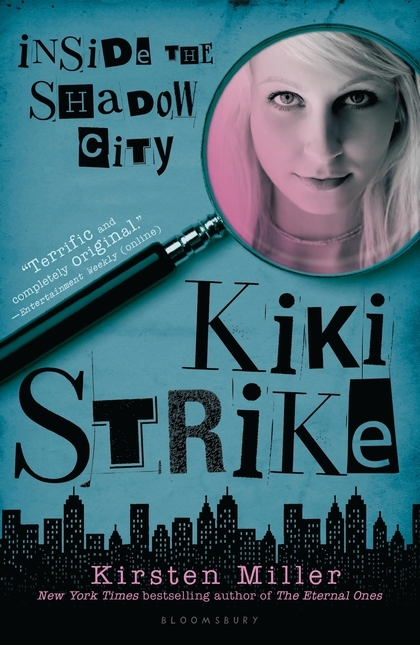 In the first book, Kiki creates a group of friends who call themselves, "The Irregulars" and she takes charge of her group as they start their adventures together. 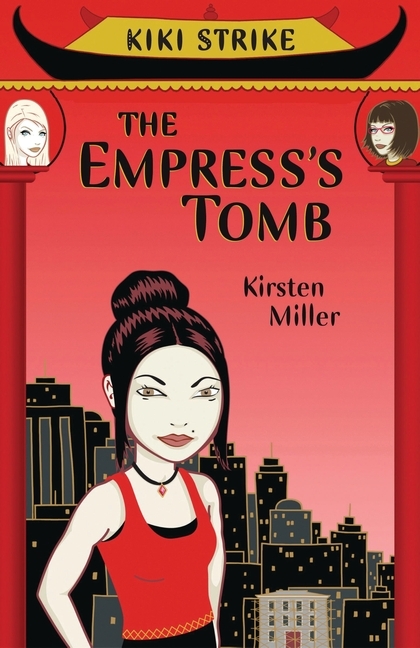 They learn Kiki's true identity, what her mission is, and whether or not they can trust her. In the next book they continue their adventures together and start to learn things about Oona Wong, the fashion Chinese girl with an attitude. When they discover some dark secrets about her family, they have to decide whether she should be trusted, or whether she is loyal to other people. And, finally, in the third book, that recently came out, readers learn all about Betty Bent. Betty has her own adventure while the Irregulars can only sit and watch it play out. They discover that being tough is not always the only way to be strong. Being nice is more courageous at times. All of the books are written in Ananka Fishbein's voice, and she gives you some nice tips. Although these tips are not necessary to read, and only loosely relate to the book, they are really funny, and they help you understand what Ananka is thinking. The Following test will help you determine whether you're ready for action--or could use a little more practice. Keep in mind--in real life, there are no multiple choice questions. 2. What time did your next-door neighbor leave his house this morning? c. I would never intrude on someone's privacy! d. Come to think of it, I haven't seen him in weeks. Maybe I should knock at his door"
[These] come in handy when you're avoiding an annoying suitor, evading the authorities, or running from a furious sibling. Unless you're attending a ball, try to wear clothes that will allow you to move comfortably. In particularly dangerous situations, you may want to choose fabrics such as wool or silk that won't easily catch on fire or melt under extreme heat." Each book gets a little older, the first book starts out really simple, with a bunch of seemingly little girls. The next one, they are a little bit older, a little more experienced, and you start adding a little bit of boy drama when Kaspar, Betty's soon to be boyfriend, enters the story. By the third one, they have added more boy drama, and a little language. I think that they will probably come out with more books in the series, but I really liked these books because they were language free, so although it will still be a fun, adventurous read, don't count on them being language free from here on. 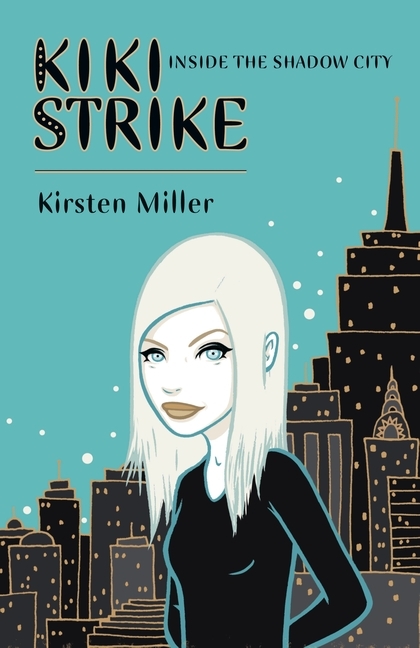 The only slight problem that I had with the book was that Miller kept foreshadowing and I was very annoyed with it. At the end of the chapter, it would often end with a statement that was going to give away the next part of the book. Personally, I would rather figure it out myself, instead of having it told to me. "But before the night was over, the Irregulars would discover the terrible price they had paid for their pleasure." "'I'll wait. It's not that important,' said Oona, and I suddenly suspected it was." Overall, I really liked these books, and I am still looking forward for the next one to come out.